More scenes from the Norwich Blitz. Probably the morning of 28th April 1942. Tough ones. I spent far longer trying to work out where it was than normal, and there’s story behind this scene that you will find below that brings the cost of it home. 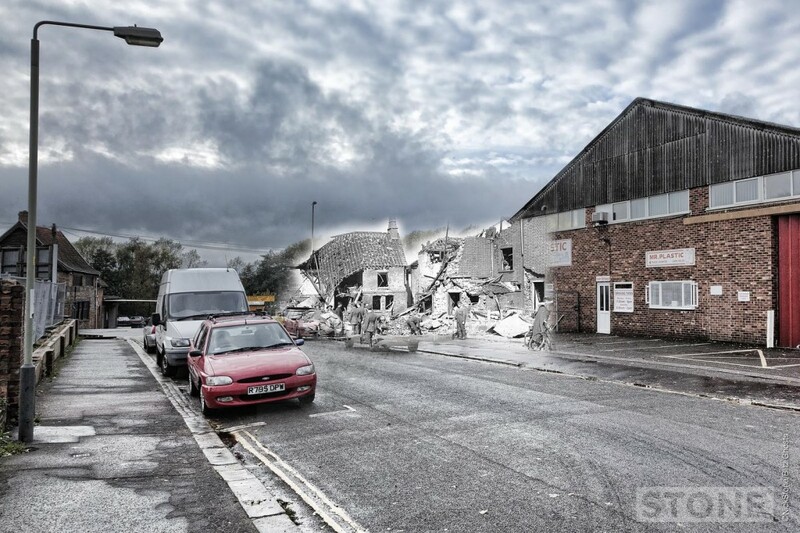 I found the spot eventually when I realised the thing propped up with wood on the left is the Maltings which is now Mitchell’s reclamation yard, behind that the two houses and the Dun Cow’s roof sticks out, on the original you can just make out the shop and houses at the bottom of Wingfield Road, Bakers Road is just to the right. It’s when you see this and find the context you suddenly realise just how ravaged certain areas were, so little is still there, The Great Hall survived, which is behind me and to the left. Nearly all of Oak Street was written off. with vast amounts of bomb damage to the whole area surrounding City Station on the other bank of the river. The junction of Oak Street and Sussex Street just off St Augustines. In time very near St Martin’s Gate and a very old busy and industrious place. This corner also features in another rephotograph earlier in my stream, shot from just down on the left. The whole end of Sussex Street was torn off on the night of 27th/28th April 1942, You can tell in the road and building patterns now. There are even shrapnel scars in the walls nearer the St Augustines street junction, real Blitz ghosts in the brickwork. This is where Sam Bussey and Len Scrivens tried to save the horses on Oak Street, Sam died, Len crawled to safety and somehow survived. 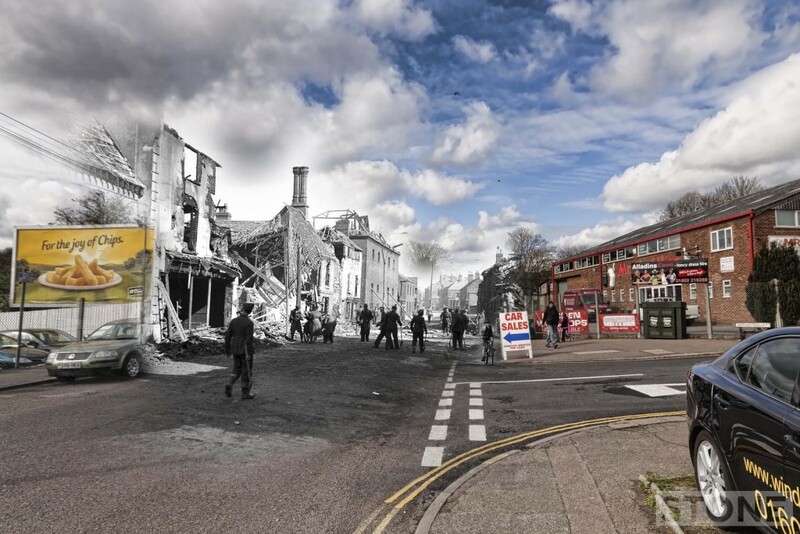 “Monday 27th April 1942 was the night of the first Blitz on our lovely city of Norwich. I was on the 6am to 2pm shift that day, doing telephone operator duties with the National Fire Service A Division based at Bethel Street, Norwich. I was at home that night and had retired to bed as usual around 10pm. Not long after came the sound of ‘Moaning Minnie’ as we called the air raid sirens. They always seemed to start around that time and we had become so used to planes passing overhead and going on to targets in the Midlands and North of England. Norfolk seemed to be the pathway to these targets, so we had become rather complacent about getting up and taking shelter. Then cane the usual drone of the enemy planes but instead of passing over they started circling round the city. Looking out of my bedroom window I could see the whole city of Norwich lit up like daylight with the pathfinder flares and I just knew something terrible was about to happen. We hurriedly scrambled into our brick and concrete street shelter only a few steps away from our front door. Then followed nearly two hours of sheer terror. Apart from the noise of the aircraft dropping their bombs there was also the noise of the anti-aircraft guns. One of these was situated on St James Hill, Mousehold (Heath) only a short distance from our shelter, the noise from this was dreadful. Suddenly the anti-aircraft guns stopped and we heard a different sound, that of fighter planes which had come along to chase away those horrid bombers. I learned later they were most probably Hurricanes stationed at Coltishall. After the All-Clear sounded we groped our way home. It was such a strange atmosphere, all smoky and exceptionally quiet after the noise of the raid. Just the clanging of the fire-bells and ambulance sirens. We found our home intact and all services still working and made the inevitable ‘cuppa’. These are amazing. I’m researching these maltings, and have not come across these earlier photos. There were maltings on the site from at least 1797.